Getting to know the crocheting basics means that you are ready to start a serious project. For example, a sweater. Even if you are an experienced crocheter or knitter, sometimes it is not that easy to follow the instructions in order to make a project. It becomes even more confusing if the instruction is written for a standard clothing size and you have to make some corrections to meet your requirements. Meanwhile, you can make your life much easier if you don't mind making some simple calculations. 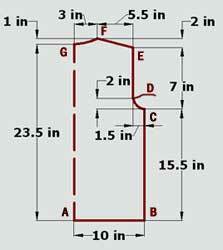 Once you understand the logic of these simple calculations, it won't be a problem to design any pattern you need. I will show you how you can do it. 1. A pattern of a sweater for your project. Like this one in the picture below. It doesn't have to be a full-scaled pattern. A small sketch is quite enough. 2. You should make a pattern swatch and calculate gauge. 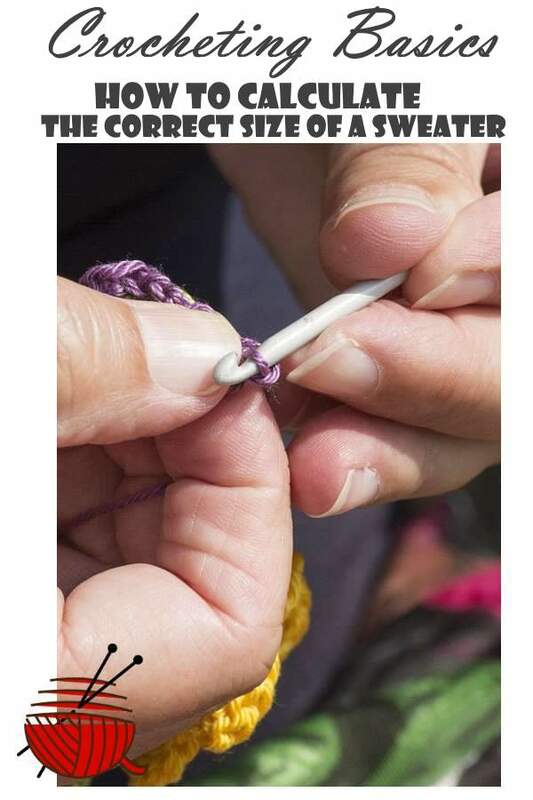 I explained how to do it at the Beginner Crochet page. Crocheting Basics. Calculate the number of rows and stitches necessary for your project. We will make calculations for the back of a simple sweater with set-in sleeves. On the picture, you can see one-half of the back pattern. Line AG is a middle line of the sweater back. Let us begin. 15.5 in x 6.5 rows/inch = 100.75 rows. 2 x (10 in - 1.5 in ) x 6.75 stitch/inch = 114.75 stitches. 135 stitches - 115 stitches = 20 stitches. 2 in x 6.5 rows/inch = 13 rows. Rows 1 - 10: decrease 1 stitch at the beginning and 1 stitch at the end of the row. Rows 11 -13: No decreases. (5.5 in x 6.75 stitch/inch = 37.125 stitches) in 13 rows (2 in x 6.5 rows/inch = 13 rows):at the beginning of the rows 1,3,5,7,9,11 decrease 5 stitches (30 stitches total), at the beginning of the 13 row - 7 stitches. Line FG (neck line). As a rule, decreases for the neck line begin at the 1/2 height of the shoulder line. For our case approximately 6 rows (1 in x 6.5 rows/inch = 6 rows). There are 41 stitches for the neck opening after the shoulder slopes are finished (115 stitches - 2 x 37 stitches = 41 stitches). Decrease 21 stitches symmetrically about the line "GA". 10 stitches = (41 - 21)/2 from each side of the neck opening (20 stitches total) have to be decreased in 6 rows. Once you decreased 21 stitches around the middle point "G", each shoulder slope should be crocheted separately. Decreases: 1st row-3 st., 3nd row-3 st., 5th row-4 st.